Synology has been relatively quiet over the last couple of months (barring the responses to various security issues), but, today, they are coming out with a couple of expected announcements. Seagate has the bragging rights for being the first vendor with an off-the-shelf NAS based on an Intel Rangeley SoC (the storage platform integrating Silvermont CPU cores). Today, Synology is introducing their first NAS model utilizing one of the Silvermont-based SoCs, the DS415+. Compared to the 1.73 GHz dual-core Intel Atom C2338 in the Seagate NAS Pro units, the DS415+ utilizes a 2.4 GHz quad-core Intel Atom C2558 C2538. The availability of hardware-accelerated encryption (AES-NI) is touted as a major feature. Other than that, thee DS415+ is the typical SMB-targeted 4-bay NAS, sporting dual GbE ports and a host of virtualization certifications. 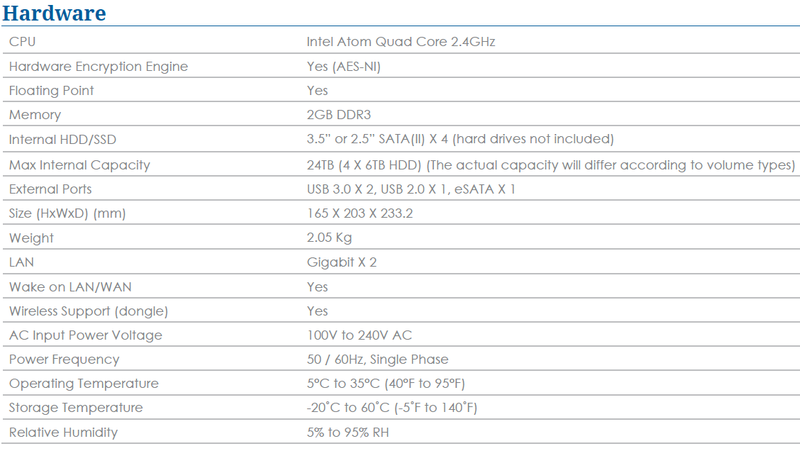 The hardware specifications of the Synology DS415+ are provided below. The important aspect to note here is that, like the Seagate NAS Pro units, the internal drive bays are all connected to SATA II 3 Gbps ports. With SSDs, one is unlikely to obtain maximum performance out of the unit when it comes to internal transfers (such as LUN cloning through VAAI), but the four SATA II ports are enough to saturate the two GbE links for external traffic. Synology claims over 235.04 MB/s reads and 233.51 MB/s writes for targeted workloads. With encryption enabled, the AES-NI feature enables 234.97 MB/s reads and 213.14 MB/s writes for the same workloads. In other Synology news, we also have the launch of the new beta of their NAS OS, the Disk Station Manager (DSM) 5.1 beta. Updates in DSM 5.1 include synchronization across encrypted folders, usage of Windows ACL for privilege settings in Cloud Station and an option to disable versioning. Three new public cloud services (OneDrive, Box and hubiC) have also been added. IPV6 support for Quick Connect also comes in the feature set. Other improvements include NFS VAAI support (in addition to iSCSI in earlier DSM versions) and a better interface to the SSD caching setup. Security features (in the form of a new Security Advisor and AppArmor package) also receive focus in this release. On the mobile apps side, DS File has been updated (iOS users can play files from within the app, while support for third-party integration is present in Android 4.4+) and a new DS Note app synchronizes with the new Note Station package (similar to EverNote and OneNote) on the Synology NAS. Probably to save costs on a second controller chip. Rangeley doesn't have native USB3 support. The use of 3GB sata is also due to Intel limitations; the chip only has 2 6GB sata ports. While I can understand the decision to only use USB2 to keep costs down (arguably the enterprise market should be backing up over eithernet not USB); gimping most of the sata ports to 3GB seems odd; especially since it's capable of running ethernet in up to a 4x2.5GB mode meaning cases where not all the disks were being accessed equally at once could bottleneck on the disk IO. One aspect is the 'playing nicely' factor. Now that I am having issues with my DS411j, I find that Synology is not a good company to be stuck with when a problem develops. I have reported my problem using the submission form, and I have posted it on the Forum. Not a single peep from either direction. I have no idea how long it will be before - even if - I get a response. On the Forum, my post has already scrolled way out of view, so nobody will probably ever see it. I called the office number (which the web site says is good for 9-5 PST) only to be told that the office shuts at 4pm. I'm pretty fed up. The user manual is USELESS. The "Troubleshooting" section essentially says "Go to our web site (where you won't find a troubleshooting section either)". Now I'm stuck here with several terabyes of important data, and I have NO CLUE when - or even if - I am ever going to see it again. Do you see that thing over there? The Synology Disk Station DS1813+? It’s crap. It’s not the usual hardware RAID problems that make it so crappy. Yes, it’s slow. Painfully slow. if you reboot it. How have they even managed to do that? It’s that if one of the disks break (as they are wont to do, which is why we have the “R” and “I” in “RAID”), which usually happens at 2am, the thing starts beeping. And there’s no way to turn the beeping off. Other than switching the entire thing off. So you have a redundant disk system, but if one of the disks break, it starts beeping so loud that it’ll wake all the neighbors, so you just have to switch it off until you can find a new disk to replace the old one. So it’s redundant, but you can’t use it. Ingenious. The only thing I can recommend about the Synology DS1813+ is that it’s less unstable than any of the other commodity hardware RAID devices I’ve used. Which means that as soon as 8TB disks become available, I’m going to just make a soft RAID device and escape the horrible clutches of hardware RAID makers. This is a copy and paste from a few different user posts and complains about two separate products. It seems to be all that the person running this account does - find complains about a product or company and copy/paste them into the comments section of semi-relevant Anandtech articles. Can this account be deleted or banned from posting on articles?